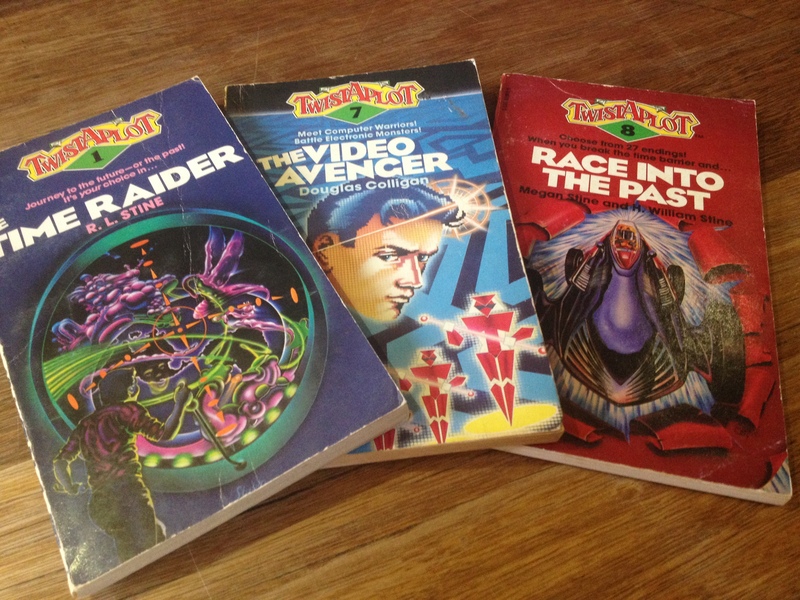 If you grew up during the ‘80s or ‘90s, chances are you had a few Choose Your Own Adventure books on the bookshelf. Or maybe you would’ve seen some at school, or perhaps your best friend’s older brother had a box of them hidden away somewhere. With their eye-catching cover design – colourful, cartoonish scenes of thrilling action set against a white background – and snappy titles like Prisoner of the Ant People and The Race Forever, the little paperbacks were damn near ubiquitous. 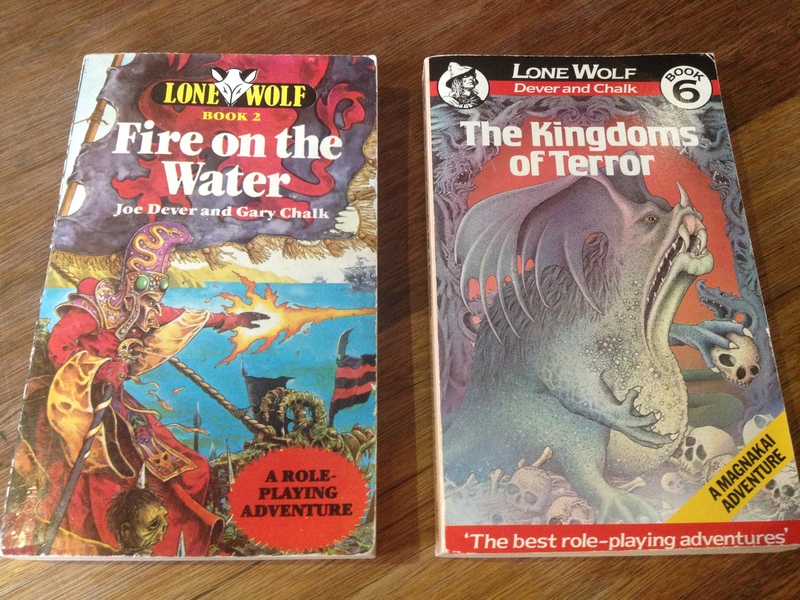 So it’s a little odd now when I say, “Oh, I collect gamebooks,” and people don’t know what I’m talking about. 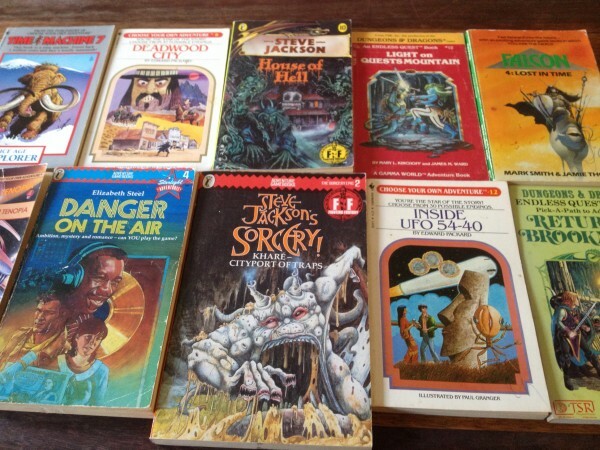 At least not until I say, “You know, like Choose Your Own Adventures.” Even though Choose Your Own Adventure books remain the best known of gamebooks, they were only one among many hundreds of series that collectively ran to thousands of individual titles. Gamebooks weren’t just a craze; for a generation of people they were a cultural phenomenon, part of the shared zeitgeist. You know you’re reading a gamebook when the book starts talking to you, asking what “You”, the reader, wants to do next. A typical choice might go like this: “If you want to investigate the strange noise in the corridor, turn to page 34. 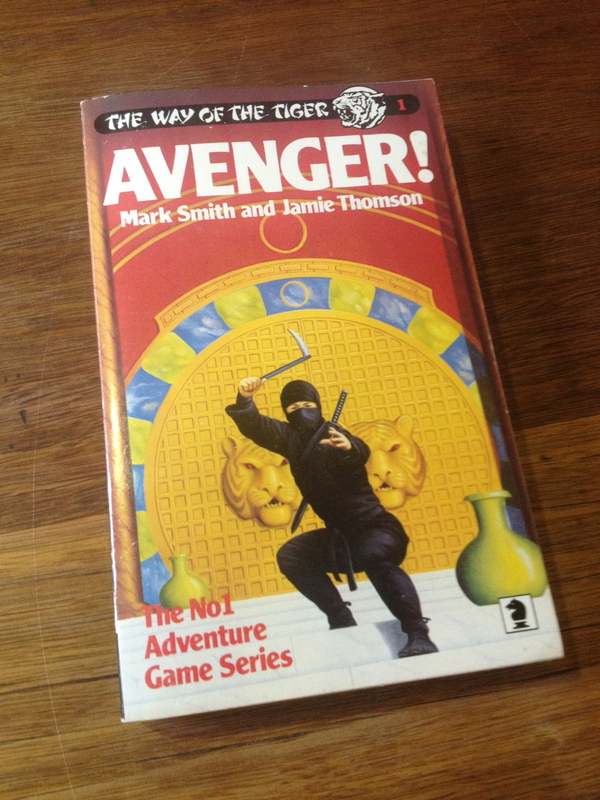 If you want to run the other way, turn to page 5.” Gamebooks weren’t meant to be read through from beginning to end. Instead, you kept reading until you reached a fork in the story, turning to a different page every time you were asked to make a choice, until you reached the end of the book. 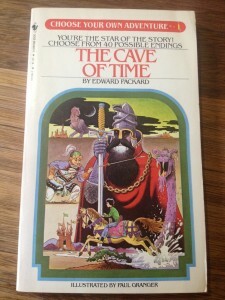 Except most gamebooks had more than one ending, so once you’d finished reading the first time you could go back and start over again, this time making an entirely different set of choices, resulting in a completely different story. But none of these early efforts ever coalesced into something larger, and branching path narratives would remain a literary oddity until the late 1970s. 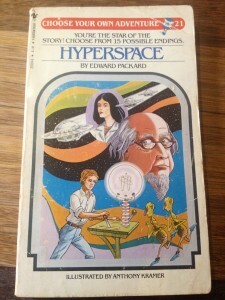 The “invention” of gamebooks as we know them today largely rests on the work of two American writers, Edward Packard (b. 1931) and R. A. Montgomery (1936-2014). Write it down he did. The resulting book was eventually published in 1976 as Sugarcane Island. Packard’s publisher, Vermont Crossroads Press, was owned by husband and wife team Constance Cappel and Raymond A. Montgomery, Jr. Intrigued by Sugarcane Island’s unique approach to telling a story, Montgomery wrote a follow up, Journey Under the Sea, intended to be the second installment in a proposed The Adventures of You series. However, Montgomery and Cappel’s marriage broke up soon afterwards, prompting Montgomery to sell his share in the family business and take The Adventures of You to Bantam Books instead. 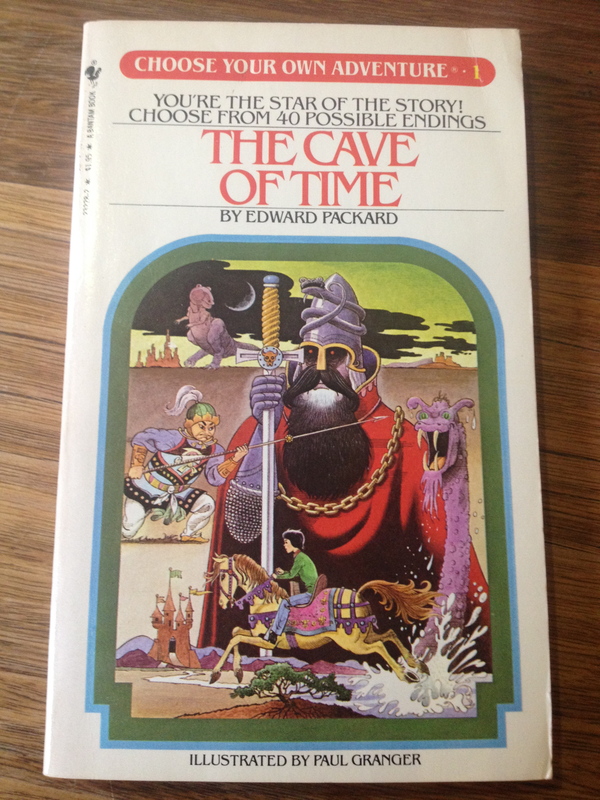 Bantam contracted Montgomery and Packard to write a further five books, the first of which was The Cave of Time. Against all expectations, the rebooted series – now named Choose Your Own Adventure – was an immediate success. The original series ran from 1979-1998 and included no less than 184 titles, selling more than 250 million books worldwide. Packard and Montgomery would both write over 60 books each in the original series and its spin-offs. 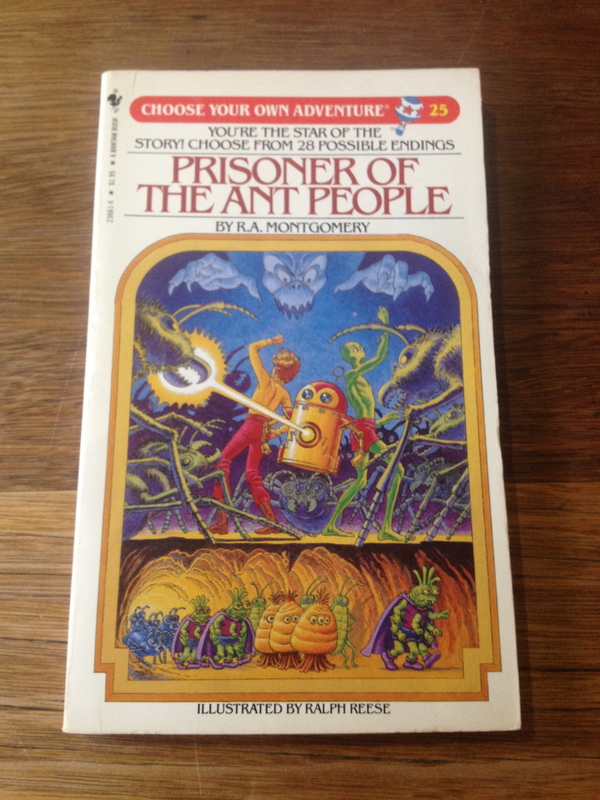 Choose Your Own Adventure books were the first successful series of gamebooks. As such, they set the format for what’s now sometimes called the “American tradition” of gamebooks, as opposed to the slightly younger “British tradition”. These are terms of convenience, of course; American writers and publishers released gamebooks in the “British” tradition, and vice versa. Generally, American style gamebooks were written for children or young adult readers, almost always published in a series, and ran the full spectrum of popular genres from westerns to science fiction to romance. In the early years of the gamebook boom they were written for both male and female readers, and significantly they lacked randomised gameplay mechanics. To paraphrase Einstein, American gamebooks don’t play dice. 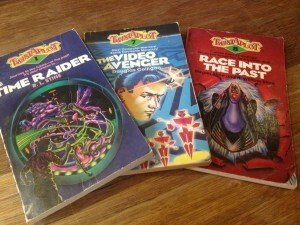 In addition to Choose Your Own Adventure, some of the more popular gamebook series in the American tradition included Time Machine (Bantam, 1984-89), which had the laudable goal to make history exciting for younger readers; Endless Quest (TSR, 1982-1996), set in the various fictional universes of TSR’s role-playing games such as Gamma World, Top Secret, Star Frontiers and Dungeons & Dragons; and the many imitators of the Choose Your Own Adventure format, including Twistaplot (Scholastic, 1982-85), Which Way Books (Archway, 1982-86) and Find Your Fate (Sphere, 1984-87). British style gamebooks were distinguished from the American tradition by marrying the game mechanics of roleplaying games to the gamebook format. As the back cover of Fighting Fantasy books says, “All you need is two dice, a pencil, and an eraser to start your journey.” People still ask me why an eraser was needed to read Fighting Fantasy books – as fans of the series know so well, the eraser was used for changing character statistics like Skill and Stamina points in the Adventure Sheets provided in each book as these values rose and fell with combat and various other actions. 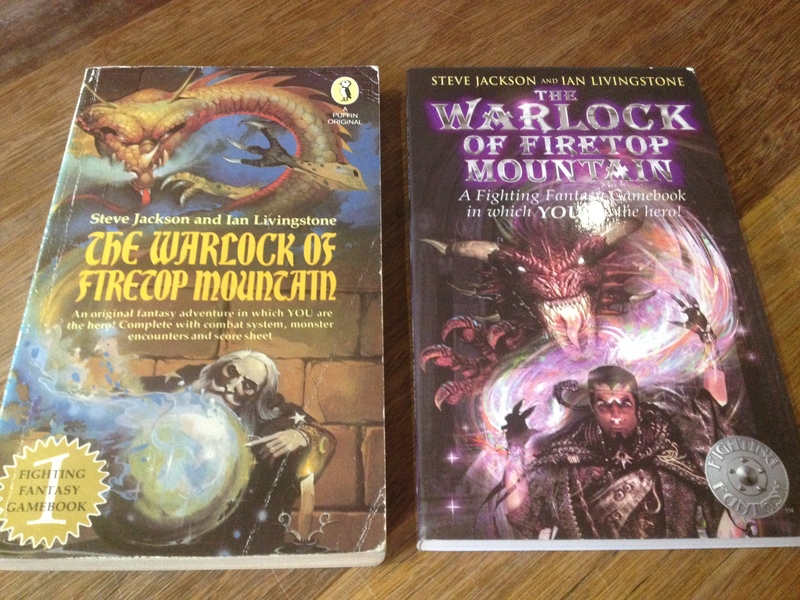 Consequently, first edition Fighting Fantasy books with un-marked Adventure Sheets are a rare find for collectors. British gamebooks differed in other ways too. American gamebooks were comparatively literate – “You”, the main character, usually had a backstory and the choices in the text were often several pages apart. In contrast British gamebooks were written in short, paragraph-length sections in plain language that has been compared to ‘telegraphese’. With some notable exceptions Fighting Fantasy books famously had 400 paragraphs, where paragraph “400” represented the only completely successful ending to the book. And finally, showing their pedigree in roleplaying games, British gamebooks were largely limited to the genres of fantasy, science fiction and horror, with a few tentative excursions into super heroes and historical fiction. 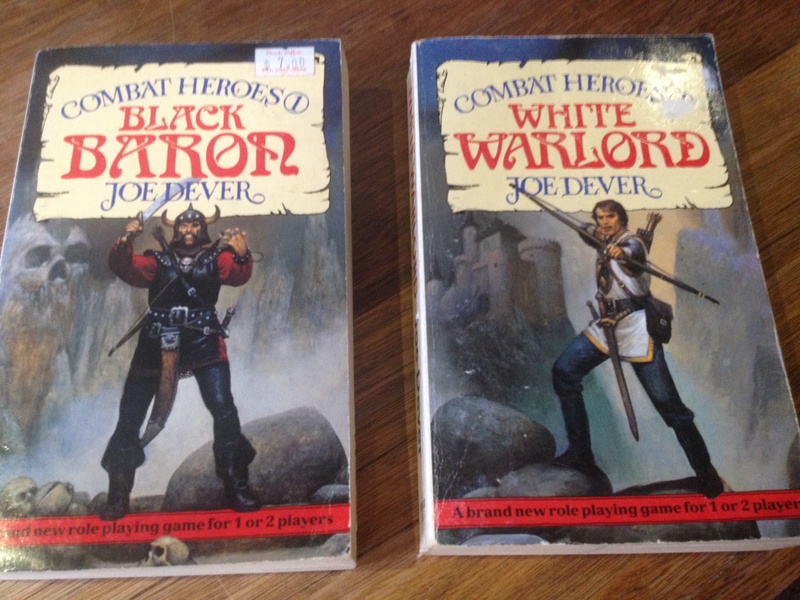 Aside from Fighting Fantasy, some of the best known gamebook series in the British tradition include Joe Dever’s epic campaign saga Lone Wolf (Beaver Books/Berkley, 1984-1998), Mark Smith and Jamie Thomson’s martial arts influenced The Way of the Tiger (Knight Books/Berkley, 1985-87), and J.H. Brennan’s Python-esque Arthurian meta-adventures, Grailquest (Armada/Dell, 1984-87). 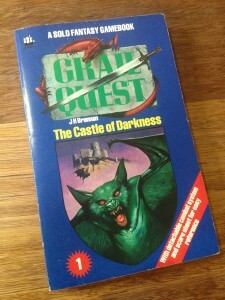 Though the major series continued releasing titles until almost the new millennium – Puffin originally planned to wrap up Fighting Fantasy at 50 books, but a late spike in sales granted the series a reprieve and a further 9 books were commissioned – the peak of the gamebook boom had come and gone by the late ‘80s. It can’t be just a coincidence that so many gamebook series were discontinued between 1985 and 1987 … Perhaps the most oft cited reason for this precipitous decline is the rise of computer games. Computer games offered a similar interactive experience to the primary target audiences of teenage boys, only one that was more immersive and cinematic. Or so the argument goes. 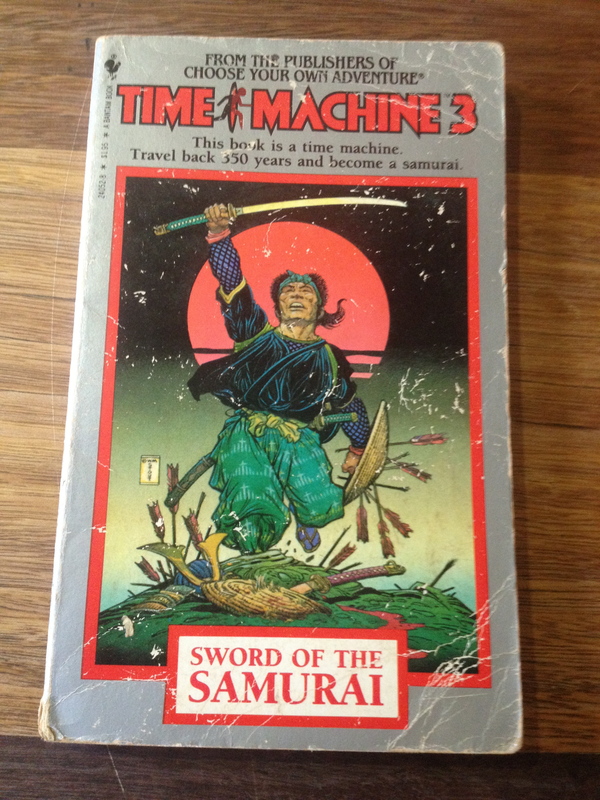 But gamebooks and computer games evolved in parallel, and there was much cross-pollination between the two industries. Many gamebook writers went on to become computer game designers – Ian Livingstone, for instance, was made a CBE in 2013 for services to the British computer gaming industry. 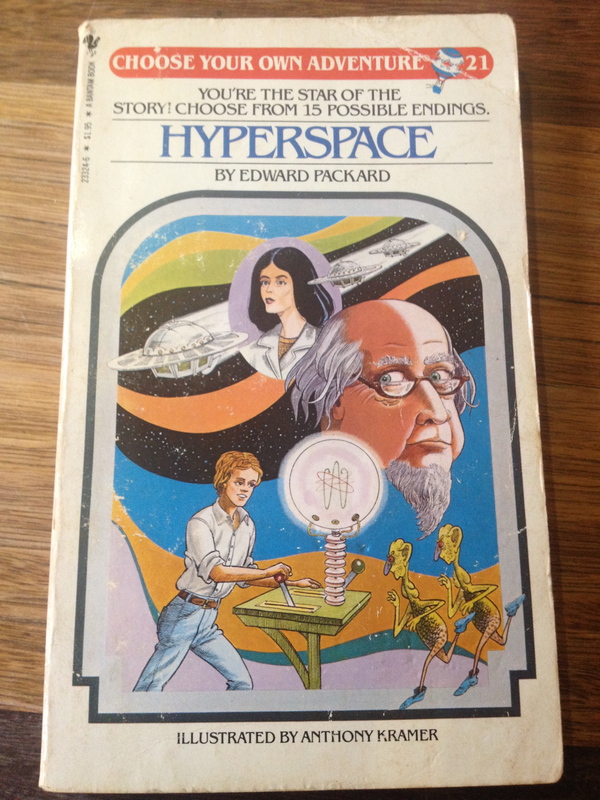 Early Infocom text adventure computer games like Zork (1980; adapted into a gamebook series of the same name by Puffin Books in 1983) and The Hitch-Hiker’s Guide to the Galaxy (1984) were influenced by the second person branching narrative structure of gamebooks, while computer-programming protocols were adapted to cope with the game complexity of two-player gamebooks such as Duel Master (Armada, 1986-7) and Combat Heroes (Beaver, 1986). Gamebooks and computer games weren’t so much locked in a Darwinian struggle for survival as they were complementary and interconnected entertainment forms. 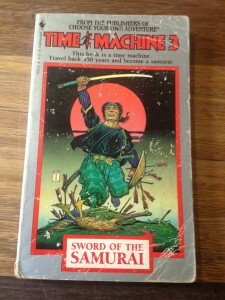 I like to imagine that in an alternate world where heavy metals are scarce or the narrative arts were further developed at the expense of technology, gamebooks would’ve evolved to fill their cultural niche as a type of “analogue” computer game. Another reason for the relative dearth of gamebooks since the year 2000 can be attributed to the conservative business practices of publishing houses. In an industry where profit margins are narrow, underperforming books and especially series are wont to be cancelled at the first significant drop in sales. 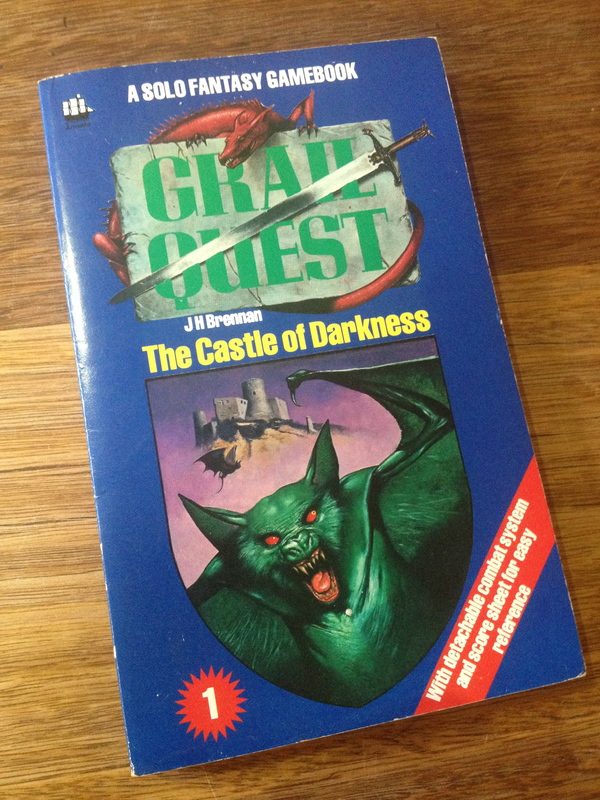 During the gamebooks boom in the mid-80s there was a glut in the market; too many titles were rushed to print, often at the expense of writing and gameplay, with the result that many series undersold and were cancelled after only a handful of planned titles. 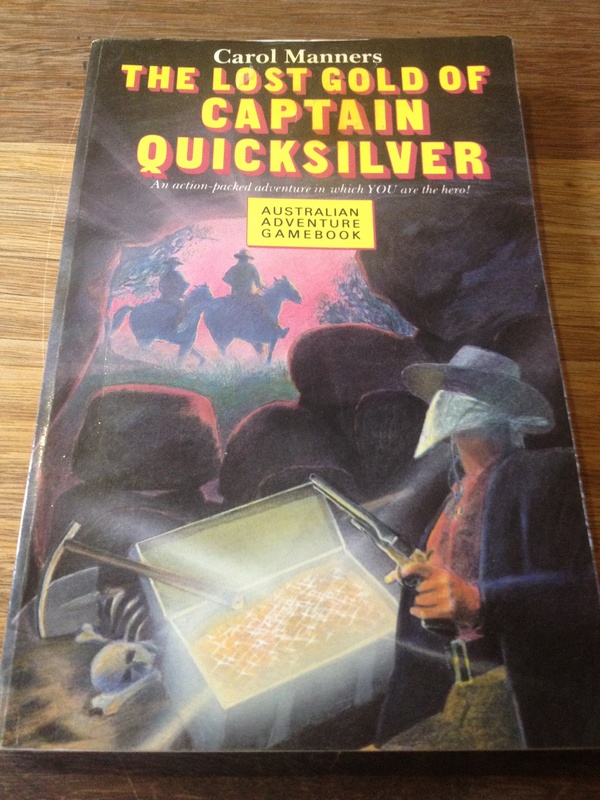 The Lost Gold of Captain Quicksilver (Penguin, 1985), for instance, has the dubious distinction of forming a “unit set”, being the sole entry released in Puffin’s Australian Adventure Gamebook series. And there’s perhaps one other reason for the near extinction of the gamebook form, one that I personally don’t want to believe. 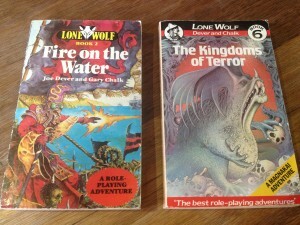 It’s just possible that gamebooks never outgrew their origins in children’s books to become a mature literary form, at least in the eyes of most readers and publishers. A comparison can be made with the comic books. Like gamebooks, comic books were originally considered juvenile and escapist, hardly “literature” at all. But their superhero characters remained enduringly popular, so that figures like Superman, Batman and the Avengers continued to feature in stories written through the successive Golden, Silver, Bronze and Modern Ages of Comics, culminating in the multiplatform cultural dominance enjoyed by Marvel and DC today. In contrast, because the gamebook bubble burst so early, gamebooks only secured a place in the popular imagination of people growing up in the ‘80s and ‘90s, which is to say Generation X and the first cohort of Generation Y. The gamebook form has suffered an arrested development, trapped in the amber nostalgia for the ‘80s. Personally, I think the relegation of gamebooks to a passing literary fad is a lost opportunity. 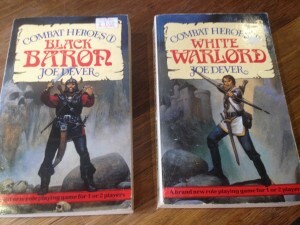 It’s true that gamebooks were often poorly written, and few could be said to confront “real issues” or the “human condition” in the way that Young Adult fiction routinely does now with such wit and sophistication. But gamebooks were fun, and for a brief time they were near universal in their appeal. More importantly, the gamebook form itself has never been explored to its full potential. 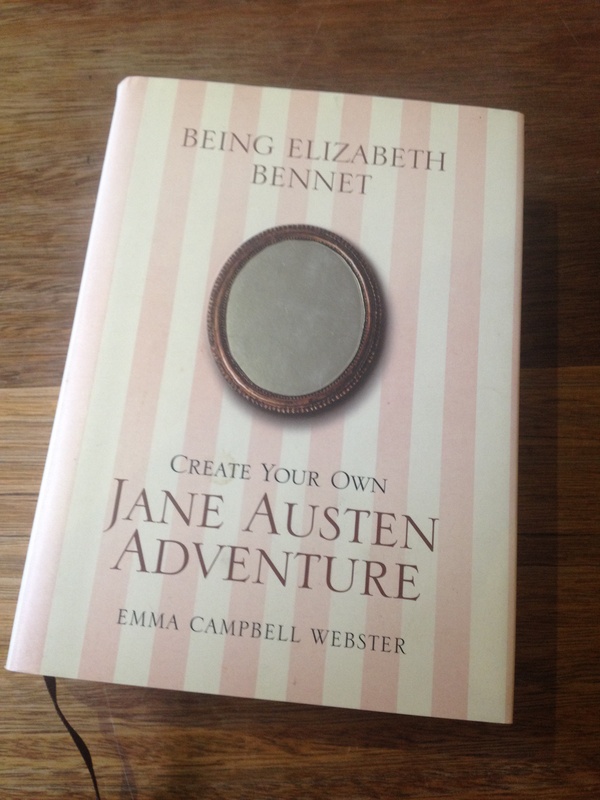 To be sure, attempts have been made to write literary gamebook novels for an adult audience, but none to date have met with any degree of success (honourable mentions include Kim Newman’s Life’s Lottery (Simon & Schuster, 1999) and Emma Webster’s Lost in Austen: Create Your Own Jane Austen Adventure (Penguin, 2007)). And yet no other form of popular literature works in quite the same way. By literally forcing the reader to choose between alternate plotlines that in a traditional story remain the author’s prerogative, gamebooks mess with the relationship between author, reader and text. Who exactly is telling the story? 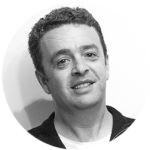 Is the author’s power somehow diminished if the story exists simultaneously in multiple and conflicting plotlines? And, if the reader does not read every possible plotline, can it be said they have actually “finished” reading the book? Or does the story linger instead in some unobserved, quasi-determinate state? The possibilities for gamebooks are endless. Or the endings are endless, perhaps. One day a gamebook might be written that finally lives up to these strange potentials. I would sincerely like to see that happen; or, better yet, to be the writer of that book. It could yet happen. 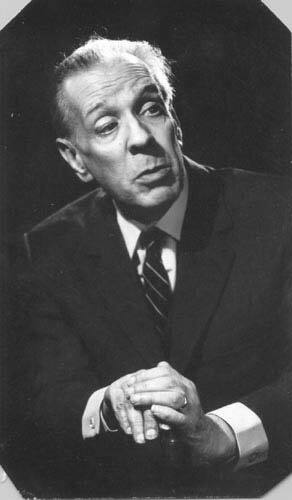 Image of Jorge Luis Borges sourced from Wikipedia. All other images owned by Martin Plowman.